With snow-capped Mount Jacinto as a background, you and your family will easily discover why Omni Rancho Las Palmas Resort & Spa is the perfect location for your next Palm Springs golf vacation. The gently rolling terrain, the palm-tree-lined fairway, the six lakes and the incredible mountain vistas are all reasons to jump into a golf cart and explore the invigorating challenges our golf course. Now stretching 6,400 yards, we’ve recently added 500 yards to our 27-hole championship golf course– which leaves plenty of room for the whole family to play. When you bring the kids to the course, they can play the junior tees found on all 27 holes. If they’re under 16, they play for half price, and after 12 p.m. it’s free! But if you’re just looking to improve your game, take private or group golf lessons with one of our PGA professionals. Of all Palm Spring golf courses, the course at Rancho Las Palmas Country Club creates the perfect location for your next family or individual golf vacation. The THREE DISTICT NINE HOLE LAYOUTS, North Course, South Course and West Course, add a unique flavor to every round. Palm tree-lined fairways, gently rolling terrain, and incredible mountain vistas are classic California desert golf at its very best. The generous fairways of this very player-friendly course wind their way throughout the resort, and with six lakes and infamous Ted Robinson bunkering, it provides a memorable challenge for even the best of players. When you stay in Palm Springs, you’ll enjoy full, sweeping views of our lush, inviting golf fairway and a plush king bed or two double beds. Experience the spacious, early-California style of our Plaza Rooms that are just steps away from our Spa Las Palmas, voted best in the valley. Take pleasure and enjoy our Lakeview guest rooms in Palm Springs while overlooking our signature 5th and 6th fairways. Just a few steps from Splashtopia, our sparkling new water feature, complete with lazy river, waterslides, sandy beach, and more. The relaxed luxury of Omni Rancho Las Palmas Resort & Spa offers a peaceful oasis, centrally located in Rancho Mirage and just minutes from popular Palm Springs attractions and activities. Home to relaxing recreation, our resort includes the Palm Desert’s largest resort tennis center, with 25 courts managed by Cliff Drysdale. We also have latest exercise equipment at our onsite fitness center and invigorating hiking and jogging trails with perfect views of the spectacular desert landscape. And when you’re ready for a swim, our family swimming and recreation area is complete with a children’s pool, waterslide, whirlpool and spa pool. 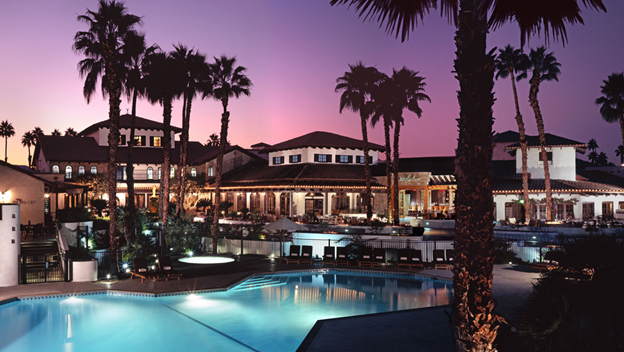 Plaza & Entertainment - With live music weekly, the Plaza is the heart of Rancho Las Palmas. Meet with friends and enjoy a desert evening around the fire pits or wake with the sun and sip a cup of Starbucks™ coffee from Palms Café. You don’t have to stray far from Omni Rancho Las Palmas Resort & Spa to get your food fix. At the resort’s signature restaurant, bluEmber, you’ll be more than satisfied tasting the chef’s inventive spin on California New American cuisine while dinning on the award-winning patio. In the morning, get caffeinated at Palms Café and snack on house-made pastries and breakfast burritos. Then go to Splashtopia, where you won’t have to leave the pool to enjoy a burger and tropical drink. And when the sun sets, quench your thirst at R Bar and try the mini burgers and excellent new slider bar. No matter what your taste buds are craving, it will always be just around the corner at our resort. Our luxurious Palm Springs hotel rooms surround you in Spanish Colonial-inspired style and a soothing desert palette of beige, sand, and ivory. With plenty of space for your peace and your quiet, you’ll also open French doors to your very own private patio or balcony where the warm desert air and breathtaking views await. Complimented by thoughtful amenities and services, you can enjoy timeless comfort in the heart of Southern California’s sun-drenched Rancho Mirage. The 444 guest rooms and 22 luxury suites are housed in captivating, Spanish-style architecture, where French doors open to private patios and balconies overlooking the lushly landscaped grounds. You’ll also sleep where comfort prevails on our premium mattresses, draped in plush down comforters, custom duvets and cotton-rich linens.